Korn Ferry’s Global Marketing Officers Practice surveyed 220 Chief Marketing Officers (CMOs) on a variety of topics to understand their perspective on the role and the major trends impacting the marketing function. 52% of CMOs say they cannot make a direct and obvious correlation between marketing efforts and company performance. 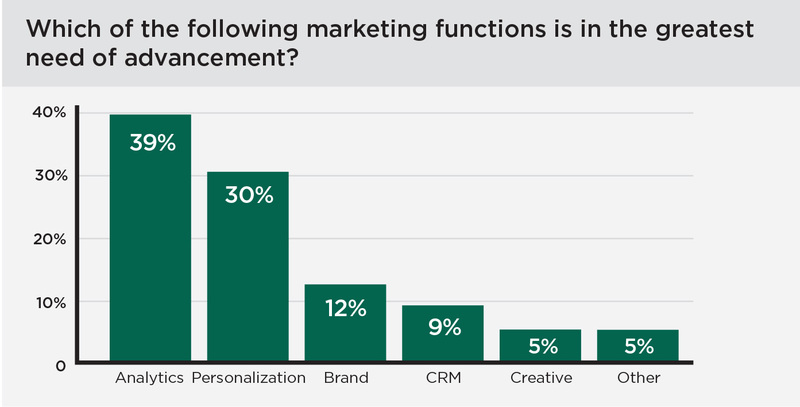 When asked what the greatest need is to advance the marketing function, 39% said analytics. 84% cited finding the right talent to help with digital transformation, including data science, digital technology, content creation and social community management, as the most important to progressing the function in the future. “Increasingly, CMOs and their teams are being tasked with leading transformation and growth efforts, which won’t be successful if they aren’t able to align strategy and direction with the rest of the C-Suite to harness the full power of the entire organization." What did CMOs report as the most important factor in determining their bonus? 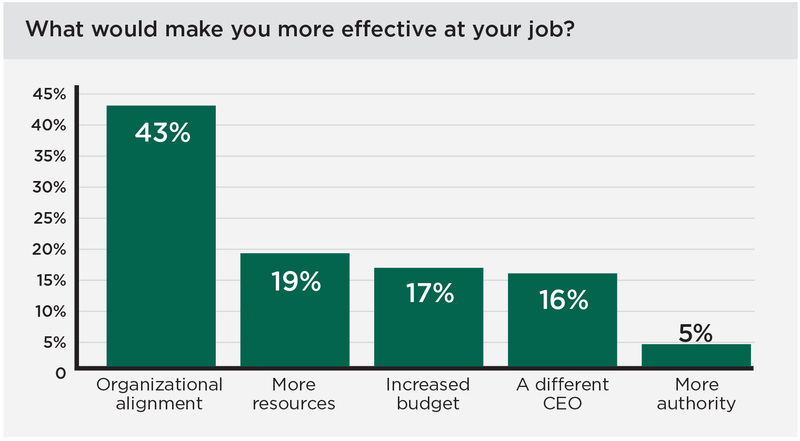 45% of CMOs reported "financial performance" as the #1 factor that impacts their bonus. 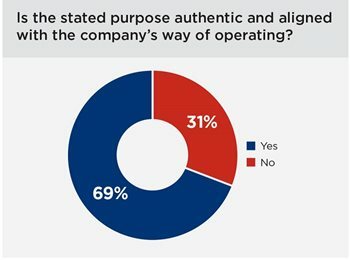 What percentage of CMOs say their organization's purpose is authentic and aligned with the company's way of operating? 69% of CMOs believe their organization's purpose is authentic and aligned with the company’s way of operating. 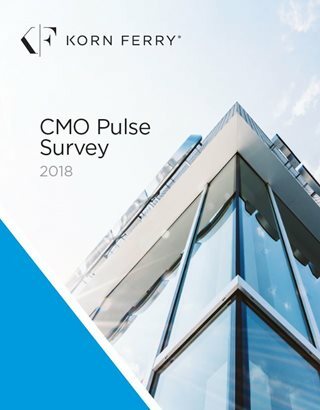 The global survey of 220 CMOs and marketing leaders took place in late 2017. Please note, percentages do not always equal 100 percent due to rounding. Korn Ferry’s Chief Marketing Officers Practice helps CMOs and their organizations deliver the corporate goals of their companies. Our solutions are designed to help CMOs transform the marketing function into a curious, agile, performance-oriented and purposeful function. In addition to recruitment across the function, the practice leverages solutions in areas such as, team optimization, assessing and developing evolving leadership capabilities and organizational structure, workforces, etc. We help CEOs and their organizations identify the marketing talent best suited to the specific paradigm of their business. Across industries, the marketing function is rapidly and continually changing and it is critical to understand what type of marketer is best suited to address an organization’s unique business challenges. Our expert practitioners serve as trusted advisors for our clients across a wide array of industries, all regions, and for companies large and small, public, PE-backed and family-run. The practice operates as an interconnected, highly collaborative global community of seasoned partners and associates steeped in the subtleties of the marketing function. The numbers speak for themselves: in just the past five years over 2,000 companies chose us to partner with them on marketing work.